For the past six years, leading content and technology solutions provider LexisNexis South Africa has run a successful Corporate Social Investment programme known as the Advocate Advancement Programme (AAP), which is endorsed by the General Council of the Bar of South Africa. Since its inception in 2012, the AAP has provided 214 newly qualified advocates from previously disadvantaged backgrounds with support, equipment and systems to aid them in advancing their careers and enhancing their skills. This year 15 new recipients of the AAP sponsorship, seven female and eight male advocates in the Gauteng region, have received technology support to the value of R59 000 each, including a laptop, 12 months’ worth of free internet access and a Platinum Package subscription to the comprehensive online legal research solution, Lexis Library. Billy Last, CEO of LexisNexis South Africa, says that the purpose of the programme is to encourage, develop and support up-and-coming legal practitioners and foster transformation in the legal field. “The cost of starting up practice is not within reach for many. 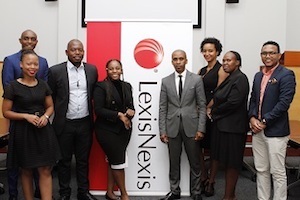 By investing over R11 million to date into this programme, LexisNexis has provided emerging legal practitioners with access to world-class tools that will help to differentiate their practices. In legal practice, time is money, so tools that allow fast and accurate legal research are critical to success,” he said. Recipients of the APP sponsorship are carefully selected from a pool of candidates who hail from previously disadvantaged communities. To be considered, candidates must be South African citizens, have an excellent academic record and must be newly admitted members of the Bar attached to a chamber of advocates. The youngest recipient in 2018 is Luyanda Mbatha, who hails from the township of eZakheni in Ladysmith, KZN. She was born in 1994, the year that all South Africans took to the polls to cast their first democratic vote. She spent 18 years in the township before moving to Johannesburg to pursue a Bachelor of Law degree at the University of the Witwatersrand. She says she chose the legal profession because she has always wanted to litigate and often dreamed of standing in a courtroom, mastering the art of persuasion in upholding the rule of law for the administration of justice. LexisNexis, in partnership with the Johannesburg and Pretoria Bars, has facilitated sponsorship handovers and training sessions for the newly qualified advocates. In addition to the Advocate Advancement Programme, LexisNexis ran a similar initiative called the Attorney Advancement Programme, which was endorsed by the Attorneys Fidelity Fund. The company also has partnerships in place with NGOs including ProBono.Org, which partners with private legal professionals who volunteer their time and expertise to provide pro bono legal services to the poor, and the Women’s Legal Centre, the National Freedom Network, Umgeni Community Empowerment Centre, the Salvation Army and others. In addition, the LexisNexis Rule of Law Champion Award celebrates and acknowledges members of the South African legal fraternity who have led efforts to advance the rule of law and strengthen civil society.